Error 90057: The variation-theme field contains an invalid value: Shoe Size. To correct this error, choose from the valid set of values. Amazon only allows you to use specific attributes for variations - which attributes are allowed depend on the main category (feed template) you're using, but if a category does allow variations at all, you will be using either Size or Color most of the time. find the box "Map Variation Attributes"
If the error persist, please remove all failed listings from WP-Lister - by using the remove from database bulk action - and prepare them again by assigning your listing profile to the products again. But I already use the same variation attribute as I do on Amazon. What am I doing wrong? The attribute names you see when you add a variable listing on seller central might not be exactly the same as what is required in a listing feed. This is usually the case when you list on a non-english Amazon sites but it might also happen on Amazon UK because all feed templates require attribute names in american english. 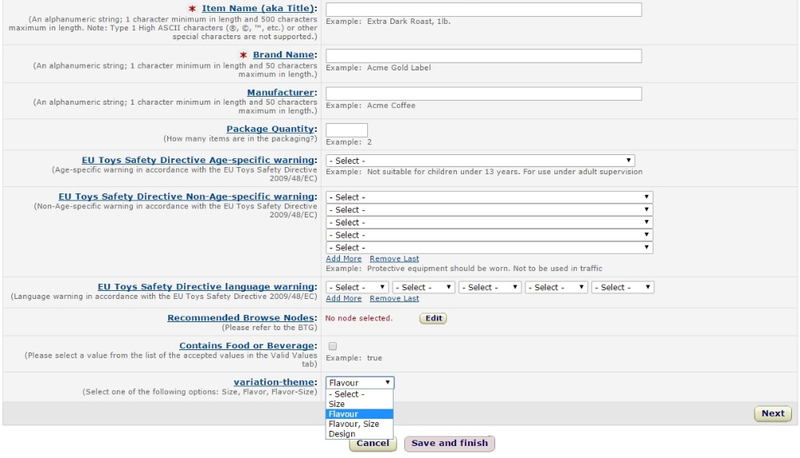 For example if you're listing to the Food and Beverages category on Amazon UK, you can select the variation attributes Flavour, Size and Design on seller central (see screenshot below) - but if you download the actual feed template and open it in LibreOffice or Excel, you will see that the "Valid Values" sheet contains the attributes Flavor, Size and Design. What is the difference between the variation theme "color" and "ColorName"? Some feed templates allow different versions of the same attribute, like "color" and "ColorName" or "size" and "SizeName". To our knowledge, these versions are treated equally. Even Amazon Seller Support wasn't able to shed any light on why those different versions exist (even though we got multiple answers which all turned out to be wrong), so it doesn't matter which one you use. Where can I see which attributes I am allowed to use in a particular category?